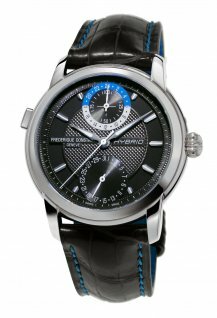 The Hybrid Manufacture will thrill fans of smartwatches who also appreciate elegant Swiss Made mechanical watches. 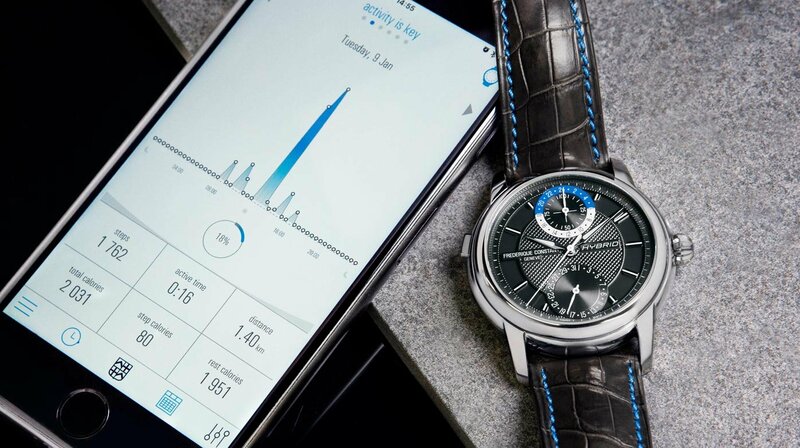 An ocean away from its home base of Plan-les-Ouates, Geneva, Frédérique Constant chose the city whose nickname just happens to include a reference to the world's biggest smartwatch producer for the launch of the world's first watch that is both smart and mechanical. Leaving no room for doubt, company founder Peter Stas has named it Hybrid Manufacture, proudly proclaiming: “we are the first to combine a mechanical Manufacture-made movement with smart functions”. 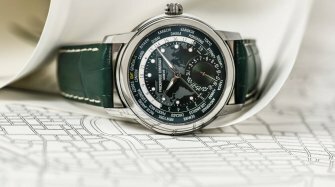 At the opposite end of the spectrum from the generic black rectangular block of the Apple Watch, the Hybrid Manufacture nonetheless plays its cards close to its chest, in that nothing visually distinguishes it from a traditional self-winding watch. 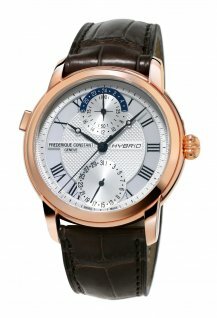 Its round case (water-resistant to 50m) frames an elegant guilloché-patterned front dial displaying classic functions such as 24-hour and date indications; while the back reveals the oscillating weight as well as the circular graining and Côtes de Genève motif adorning its movement. 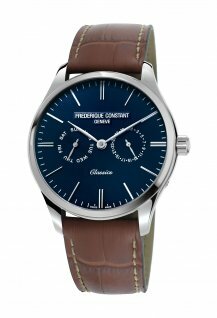 From a purely aesthetic standpoint, Frederique Constantin has clearly applied the winning formula of its previous Horological Smart Watch models, which look every inch like traditional watches yet in fact house quartz movements. 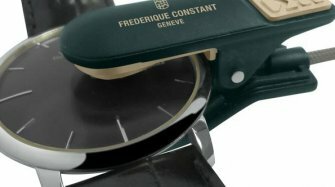 For the Hybrid Manufacture, Frederique Constant has developed in-house and duly patented a new self-winding Calibre FC-750. 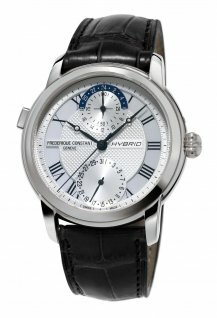 While Manufacture Frederique Constant is now acknowledged for its expertise and cost effectiveness – as vividly illustrated in the past two years by the most affordable perpetual calendar and chronograph on the market –, in 2018 it is taking a further step towards democratising horological innovation with the Hybrid Manufacture. The mechanical section of self-winding Calibre FC-750 serves to indicate traditional watch functions such as the hours, minutes, seconds and crown-adjustable 6 o’clock date display, while ensuring a 42-hour power reserve. In addition, its electronic section (also entirely developed and produced in-house) comes into play when activating the kind of functions that have thus far been the exclusive preserve of quartz-driven connected watches – such as activity tracking and sleep-pattern monitoring, intelligent fitness coaching and 24 timezone indications – while also analysing the mechanical calibre: another world first. 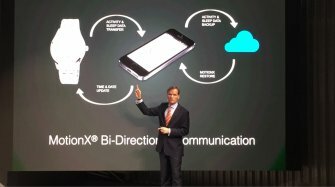 This data is displayed on the watch wearer’s cellphone via the Hybrid app and Bluetooth technology, simply by means of a connection triggered via the 10 o’clock pusher. Peter Stas commented: “When it came to incorporating two technologies into a single calibre, the technical challenge consisted in cancelling out the negative magnetic effects between the mechanical and electronic modules. Our designers and watchmakers therefore developed a unique case equipped with an antimagnetic shield.” Calibre FC-750 does indeed feature components never previously integrated within a mechanical movement, notably including a patented transmission system complete with antimagnetic shield, a Bluetooth antenna, an accelerometer (for activity tracking and sleep-pattern monitoring), a microprocessor, an analytical module to measure the running rate, amplitude and beat-error of a mechanical movement, as well as a rechargeable battery. While the usual smart functions are in themselves not revolutionary, their symbiotic relationship with the mechanical calibre definitely is – in this instance perfectly embodied by the built-in analysis of the smooth operation of a mechanical movement. This module kicks in at 4am daily thanks to an algorithm that measures its running rate, amplitude and guide-mark/beat error. The results are then transmitted via Bluetooth to the Hybrid app which displays an operational report enriched with useful explanations, while its main message is symbolised by a green signal mearing that all is well, or a red light earning that repairs are required. The Hybrid Manufacture is available in four versions, including an 888-piece limited series. All of them come in a wooden winder-box – serving both to wind the mechanical movement and to recharge the battery (with its seven-day battery life) powering the electronic functions – which has a removable charger for use when travelling. 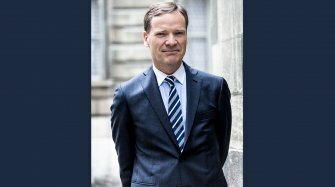 The full Peter Stas interview on this topic will appear in the Baselworld issue of GMT magazine to be released on March 21st, and also soon here on WorldTempus. Case: polished stainless steel (also available in a gold-plated version) fitted with a convex sapphire crystal and transparent caseback; water-resistant to 50m and measuring 42mm in diameter. Movement: self-winding (FC-750 Hybrid Manufacture, 42h power reserve), circular graining and circular Côtes de Genève pattern on the movement, 28,800 vibrations per hour. Over seven days of battery life. Mechanical functions: hours, minutes, seconds, pointer-type date display, connected counter. Smart functions: activity tracking, sleep-pattern monitoring, smart coach, worldtime (2nd time zone and 24-hour local time), analysis (measurements of the mechanical movement’s rate, amplitude and beat error). Pusher parameters (24-hour display, battery charge indicator, timing, worldtime, activity/sleep, exercise, naps). 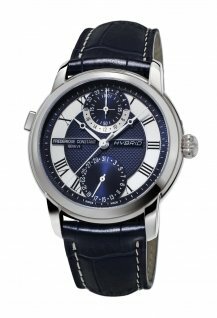 Dial: silver-toned (or navy blue or dark grey) with guilloché decoration and printed black hour-markers, hand-polished black hands, date display at 6 o’clock, connected counter at 12 o’clock. Strap: black alligator leather strap.